I spent the weekend keeping an eye on online Chinese news coverage of the successful landing of Chang’e-3 on the Moon. 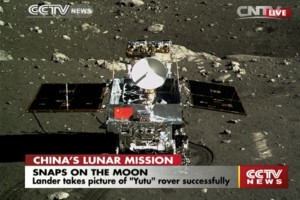 It was compelling viewing: the Yutu rover rolling down the ramps onto the Moon’s surface, turning to have its photo taken by the lander and then snapping one in return. The Yutu rover on December 15th 2013 taken by the Chang’e-3 lander. Chang’e-3 is the first spacecraft to make a soft landing on the Moon since the Soviet Union’s Luna-24 in 1976. Ten years before that, the Soviet Union were also the first nation to land a spacecraft on the Moon. Like Chang’e-3, the first lunar lander Luna-9 also carried a camera. The story of how we got to see its photographs, the first ever taken from the surface of another celestial body, is a remarkable one. From the very first days of space exploration Jodrell Bank had played a major role working with both the Americans and the Soviet Union. The first act of the Mark-I radio telescope (now the Lovell Telescope) at Jodrell Bank was to use a radar to track the rocket that carried Sputnik-1 into space on October 4th 1957 at the dawn of the space age. The telescope went on to be used in many other missions, including tracking the Soviet Luna-2 probe as it became the first spacecraft to reach the Moon. Jodrell’s observations showed it crashed into the lunar surface at 21:02:23 UT on September 13th 1959. By 1966 the Americans were set on sending a crew of astronauts to the Moon whilst the Soviets were concentrating on robotic exploration. On February 3rd 1966 the Soviet Luna-9 became the first spacecraft to land safely on the Moon, just six weeks before Neil Armstrong commanded the Gemini-8 mission which included the first docking between two spacecraft. Luna-9 had been tracked on to the Moon by Jodrell Bank. Signals received by the Mark-1 Telescope (Davies et al 1966) confirmed a landing at 18:45 UT on February 3rd. Signals from the spacecraft ceased but 4 minutes later they reappeared. At 18:58, the nature of the signals changed. One of the staff at the Observatory (J.G. Davies in Sir Bernard Lovell’s later account) quickly realised these were facsimile transmissions. An on-board camera had started taking photographs of the lunar surface and these were being beamed back to Earth by a radio transmitter. 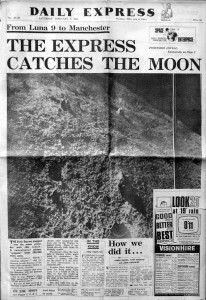 The front page of the Daily Express newspaper on Saturday Feb 5th 1966. 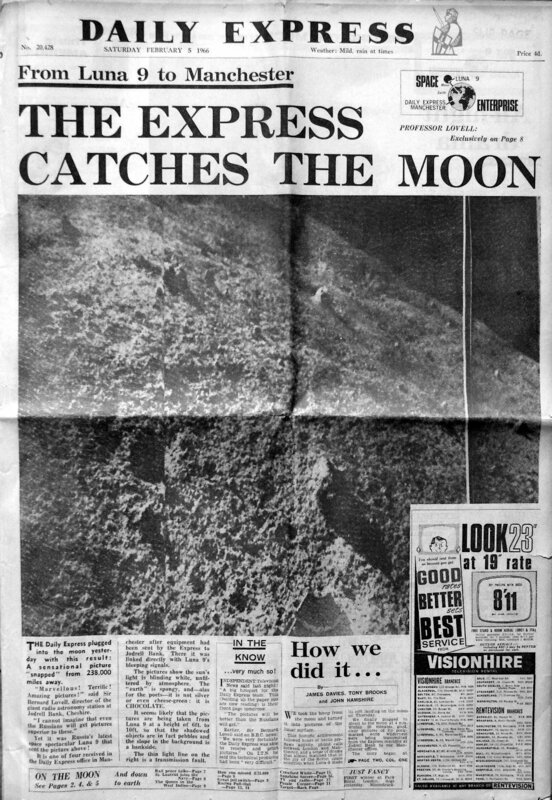 A Muirhead facsimile convertor and receiver were rushed out to Jodrell Bank from the Daily Express newspaper offices in Manchester. When the signals received the next afternoon were played through the machine, out scrolled, line by line, the first ever picture of the lunar surface taken from the surface. The photographs were broadcast on British TV in the evening of Friday February 4th and published on the front page of the Daily Express on Saturday February 5th, before any official release from the Soviet Union. By some reports the Soviets weren’t happy. Apart from effectively being scooped, they pointed out that the horizontal scale of the Jodrell photographs was incorrect, compressed by a factor of 2.5. Lovell later commented in his autobiography “Astronomer by Chance” that in an Observatory whose “entrance hall and corridors were jammed with newspapermen and photographers”, it would have been extremely difficult to have kept the photographs secret. Nearly 48 years ago, Jodrell Bank eavesdropped on Soviet transmissions of the first ever pictures from the Moon, printed them on a borrowed fax machine, and broadcast them to the world. Now a Chinese spacecraft is sending photos back and we’re all able to watch as they are streamed on the world-wide web. The technology may have changed but our nearest neighbour in space remains compelling viewing. Great article, especially the remarks in the end. I do enjoy reading about these stories as much as watching those old photographs and the new ones! It is true, the views of our nearest neighbour, despite dry and desolate, are very attractive.